Milan is a global capital of fashion and design, Italy’s financial powerhouse and is known the world over for its high-end dining and shopping. 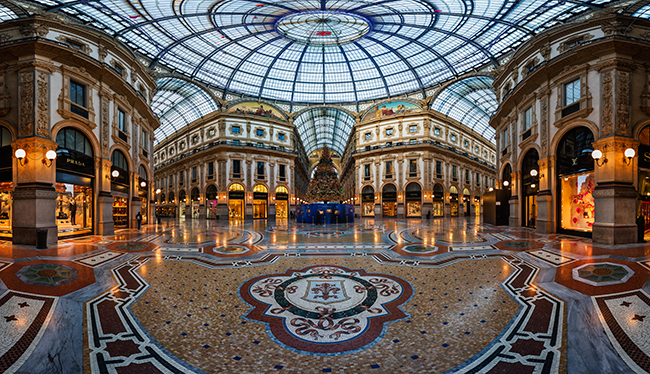 The Galleria Vittorio Emanuele II is one of the world’s oldest shopping malls. Housed in a four-storey double arcade, it was built in 1861 and is affectionately known as Salotto di Milan (Milan’s Drawing Room) due to its importance and popularity as a meeting and dining venue for locals and visitors. The Galleria contains luxury retailers offering designer haute couture and ready to wear seasonal collections from Prada, Versace, Louis Vuitton, Gucci, Armani, Tod’s and Massimo Dutti among others, which all rub shoulders with independent shops offering new and antique jewellery, books and paintings. The Galleria is also home to some of the oldest restaurants in Milan including Biffi Caffe, which opened in 1867 and is perfectly situated for people watching, while perusing the varied menu. Mention ‘aperitivo’ and you immediately think of Camparino (Campari) opened by Davide Campari in 1915, where Milan’s elite meet to take part in one of Italy’s oldest social traditions. For those in search of a taste of tradition, located just nearby is Luini, renowned for its one-of-a-kind “panzerotti” – which looks like a Cornish pasty and tastes like a calzone. The base ingredients are tomato and mozzarella and then you add in your choice of ingredients including mushrooms, ham, onions etc. Shopping in London doesn’t have to mean the hustle and bustle of Oxford Street and Regent Street. 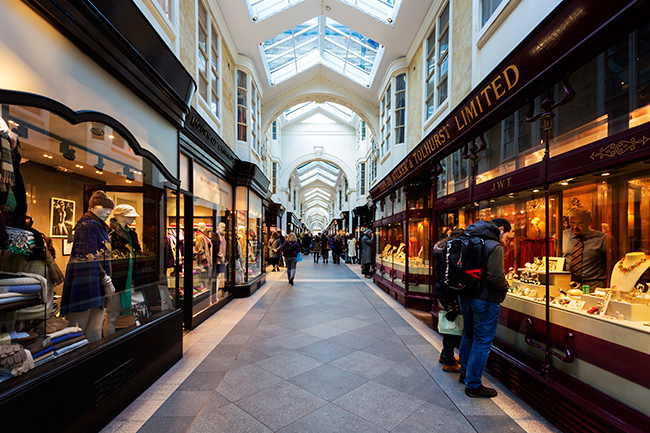 Off Piccadilly, Burlington Arcade offers a genteel shopping experience entirely undercover in a parade of shops away from the cars, buses and lorries – or horse and carriage when it opened in 1819. The arcade was commissioned by Lord Cavendish, who lived in Burlington House next door, mainly “to stop ruffians throwing oyster shells onto his property and to provide employment to industrious females”. Many of the original leaseholders lived onsite with their families among the stock in the basement and although some of the owners were male, in accordance with the rules of the day even male milliners were addressed as Madame. Burlington Arcade is the precursor to the modern shopping arcade as we know it today and was the successful prototype for the Galleria Vittorio Emanuele II and other famous arcades in Europe. 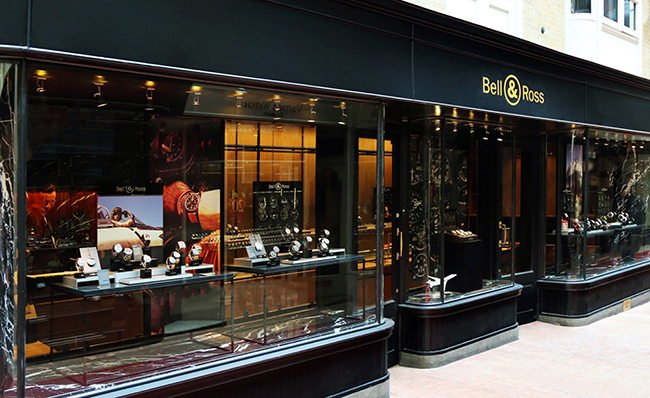 Today, shops offer the opportunity to peruse luxurious cashmere, fine and antique jewellery and antique watches. 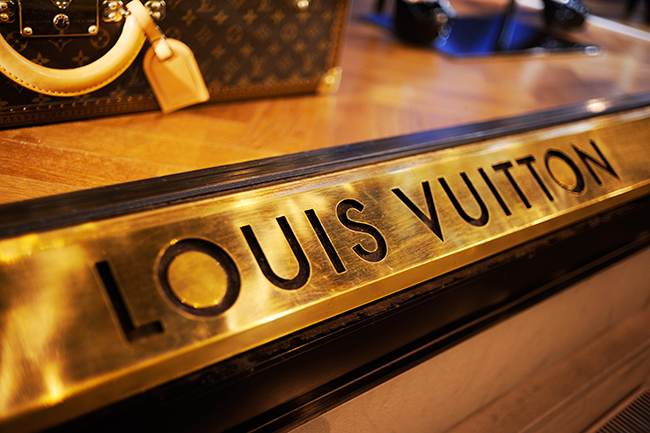 Luxury brands include the finest professional watches for astronauts, pilots and divers from Bell & Ross, Vilebrequin swimwear from St Tropez, Laduree – the finest macaroons from Paris and world famous brands Chanel and Manolo Blahnik. Highly respected jeweller Hancocks was already in receipt of a royal warrant from Queen Victoria when the family-run firm was commissioned to design and produce the Victoria Cross. Hancocks, which was established in 1849, has produced every one of the 1,350 Victoria Crosses that have been issued since Queen Victoria presented the first editions to soldiers and sailors in 1857. Burlington Arcade might lack a fine dining experience, but it is likely visitors will catch a film crew. The iconic runway uniting Piccadilly and Bond Street is regularly used as a film/TV location, including Borgen, The Parent Trap and The Veiled Lady. 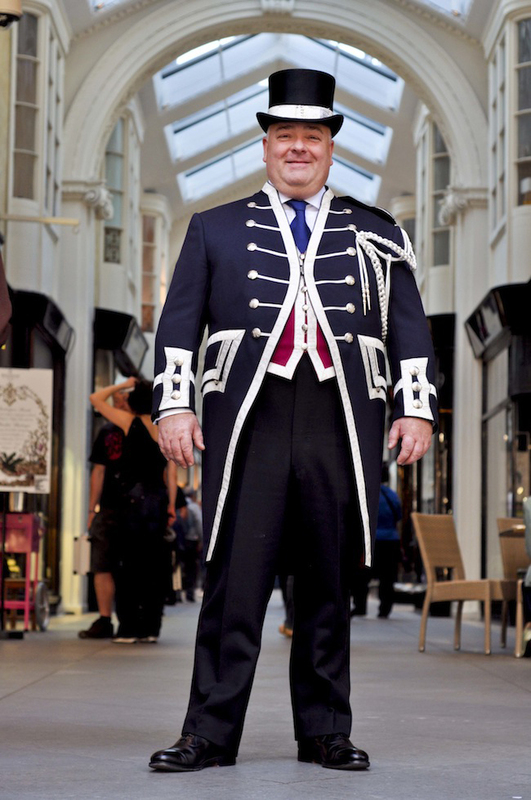 And to ensure “ruffians” are kept at bay, the entrances are protected by Beadles – the smallest private police force in existence that pre-dates the Metropolitan Police by 10 years. Until 31 August, the Arcade is featuring a spectacular installation of twenty 10ft high prints of Vogue covers from 1918-1950 to celebrate 100 years of the magazine. Like Galleria Vittorio Emanuele II in Milan, Burlington Arcade is part of a local Londoner’s everyday life. To enjoy the best of living in London, rent or buy a luxury apartment in Westminster or Victoria. For more information about residential homes in London, fill in the form on the right.